Heat a 12 inch skillet on the stovetop on medium high heat for 5 minutes. Add the olive oil and mushrooms. Let the mushrooms cook without touching for 6 minutes. Note: If the mushrooms absorb most of the olive oil, just add a little more olive oil to the pan. After 6 minutes, turn the mushrooms and let the other side cook for two minutes. Reduce the heat to medium low. Add the onions and stir to incorporate them with the mushrooms. Add a teaspoon of sea salt and 1/2 teaspoon fresh ground black pepper to the onions and mushrooms . Stir to incorporate. Add the garlic, thyme, parsley, a teaspoon of sea salt and 1/4 teaspoon of fresh ground black pepper to the beaten eggs. Whisk the egg mixture thoroughly. Arrange the mushrooms and onions evenly in the skillet. Add the egg mixture and increase the heat to medium high. When the egg mixture begins to cook along the edges, place the skillet in the pre-heated oven. Cook in the oven for 15 minutes until the eggs are set. Cut into wedges and serve. Into a sauce pan large enough to hold a pound of cooked linguine, add the garlic, oregano, basil, sea salt, crushed red pepper flakes, black pepper, and the olive oil. Begin cooking on medium low heat. After two minutes, add the clams with the can juice. Stir to incorporate. Cook on low heat stirring occasionally. Cook the linguine in a pot of salted water according to the package instructions. Reserve one cup of the pasta water. Drain the linguine well after it is cooked. Add the linguine to the pan containing the clam sauce. Add the lemon juice, parsley, and pasta water. Turn the heat up to medium high. Cook the pasta with the sauce while tossing constantly for two minutes. Serve with additional crushed red pepper flakes and sea salt, if desired. 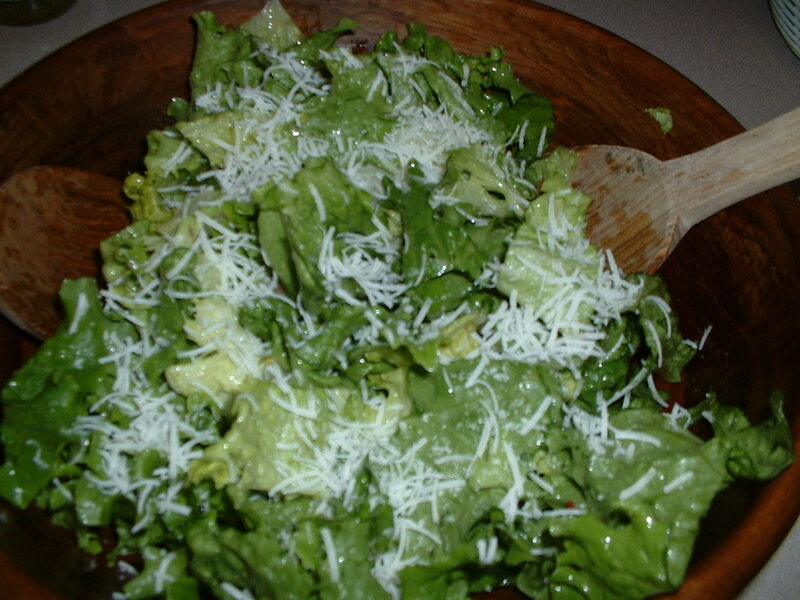 Into a salad bowl large enough to hold two heads of cut Romaine lettuce, add the sea salt and garlic. Using a fork, mash the salt and garlic until a paste is formed. Add the black pepper, crushed red pepper flakes, and anchovy paste. Mash again. Add the grated Romano cheese. Mash again. Add the lemon juice. Using a whisk, mix the ingredients well. While whisking, slowly drizzle in the olive oil. Continue to whisk until the dressing is well blended and smooth. Taste and add more sea salt and/or pepper if desired. Add the Romaine lettuce and gingerly toss the lettuce until it is well coated with the dressing. Serve with bread croutons. Note: To make homemade croutons, use day old bread cut into cubes sprinkled with olive oil, salt, and pepper and then baked in the oven at 350 degrees until crispy. Into a soup pot, add the olive oil, fennel, Spanish onion, shallot, garlic, two teaspoons of sea salt, and two teaspoons of crushed red pepper flakes. Cook on medium high heat for 6 minutes stirring frequently. Add the tomato paste. Stir the mixture until all of the tomato paste is equally distributed. Cook for one minute. Add the tomatoes and seafood stock. Stir to incorporate all of the ingredients. Reduce the heat to low. Cover the pot 3/4 of the way and simmer for one hour. Season the seafood with two teaspoons of sea salt and one teaspoon of crushed red pepper flakes. After one hour, add the seafood. Cook uncovered for an additional 20-30 minutes until the seafood is just cooked through. Taste the soup and add more sea salt and/or crushed red pepper flakes if desired. Add the parsley. Turn off the heat. Serve in bowls with crusty bread for dipping into the broth. Into a soup pot, add the pancetta, sausage, and olive oil. Cook on low heat until the pancetta is crispy and the sausage is browned. Remove the sausage from the pot and let it drain on a paper towel. Add the onions, celery, carrot, dried oregano, garlic, sea salt and the crushed red pepper flakes to the pot. Turn up the heat to medium high and cook the vegetables while stirring for four minutes. Add the tomatoes. Cook while stirring for two minutes. Add the beans (with the can juices) and cook for an additional two minutes. Add the chicken stock and the escarole. Tie the thyme, parsley, and basil into a bundle with butcher’s twine. Add the herb bundle to the pot. Stir the mixture to incorporate all of the ingredients. Turn the heat up and bring the mixture to a boil. When the soup reaches a boil, reduce the heat to low and put a lid on the pot. Simmer on low heat for 50 minutes. After 50 minutes, remove the herb bundle from the pot. Slice the sausage into 1/2 inch circles and add it to the soup. Cook for an additional 30 minutes. After 30 minutes, taste the soup and add more sea salt and/or crushed red pepper flakes if desired. Add the pasta to the soup and cook the pasta until al dente (the pasta should firm with only a slight resistance in the center). Note: stir the soup frequently while the pasta is cooking so the pasta does not stick to the bottom of the pot. These delicious fish filets can be prepared in 15 minutes or less. You can substitute swordfish and/or halibut steaks. You will just need to cook the fish a little longer (about 2-3 minutes longer on each side or until firm to the touch) . Into a small mixing bowl, add the paprika, sea salt, garlic powder, black pepper, cayenne pepper, onion powder, and dried oregano. Mix until well blended. 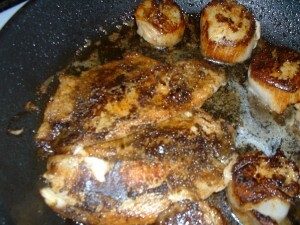 Coat both sides of the tilapia filets lightly with the spice mixture. Note: You probably will not need to use all of this dry spice mixture. Put the excess spice rub into a jar and store it for future use. Heat a non-stick pan (large enough to hold the two fish filets) on the stovetop on high heat for 4-5 minutes. Add the butter and the canola oil. Stir to incorporate. When the butter has melted into the oil, add the fish filets and lower the heat to medium high. Let the fish cook without touching for 3-4 minutes. Turn the fish over and cook the other side for 3 minutes. Remove the fish filets and serve at once. Here is a recipe for the classic one pot Cajun rice dish. Sprinkle the shrimp with one teaspoon of sea salt and two teaspoons of cayenne pepper. Add the vegetable oil, green bell pepper, celery, tomatoes, onions, garlic, thyme, bay leaf, andouille sausage, two teaspoons of sea salt, and one teaspoon of cayenne pepper to a Dutch oven. Cook for 15 minutes on medium high heat stirring frequently. Add the Arborio rice and cook the rice until it is coated with the sausage and vegetable mixture and has attained a milky white color. Add the stock and stir the rice and liquid one time. Bring the contents of the pot to a boil. Add the shrimp to the pot on top of the rice. Cover and cook in the preheated oven for 35-40 minutes until the rice is cooked. 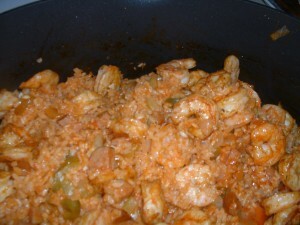 Garnish the jambalaya with parsley and green onions and serve.